Campovida is a beautiful venue located close to Hopland in Northern California. It is a small farm and winery offering a fantastic backdrop for your wedding. Imagine a space designed just for you with vineyards, a farm, a grape arbor, and a five-hundred-year-old Valley Oak tree. Impressive you think? Now add the presence of two individuals that inspire a sense of elegance and sophistication. 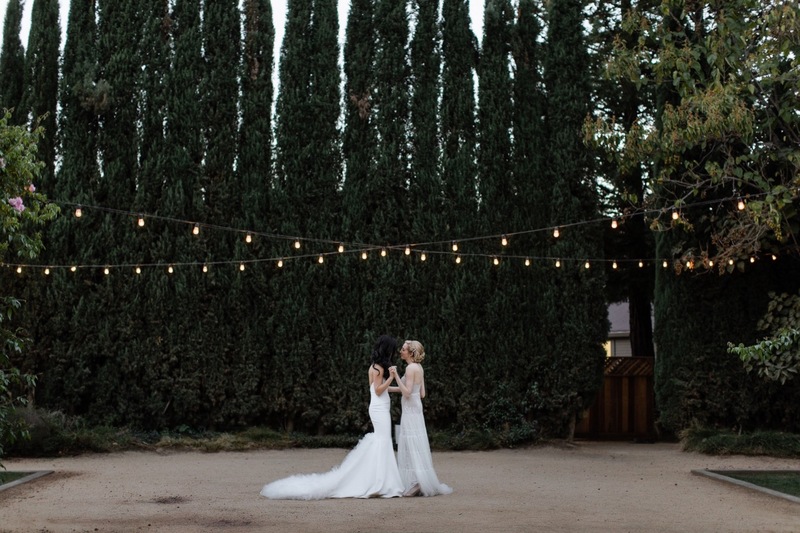 These are the feels of Sarah and Connie’s classy Campovida Wedding in a nutshell. Napa Valley is a world-famous location. We know the wineries and many weddings or couple sessions are taking place there. But Sonoma is my favorite place in the wine region. The landscape is beautiful, hilly and it feels like driving through a small village. I’m so happy to have documented many weddings already there. Sarah and Connie met a few years back in the city. They are two driven women who work extremely hard but stay focused on each other. They are huge travelers, fostering their relationship through different destination such as Belize or Greece. Getting to know them was a bubble of fresh air. We met in the Castro for their engagement session in San Francisco. I understood right from the beginning how good they are together. Supportive, smart and most of all they care for one another. It was necessary to fight the weather that day, cold and windy! It turned out to be fantastic and a great start in our relationship. Our paths cross again for their wedding a few weeks after. I was blown away by the overall mood of their day: simple, delicate and classy. Sarah chose to wear a Lihi Hod and Connie a Vera Wang. Both gorgeous! A big thank you to the entire team for making their special day a full success. Scroll down and take a peek at it! If you’re considering a wedding in the California wine region, hit me up and let’s make it happen!